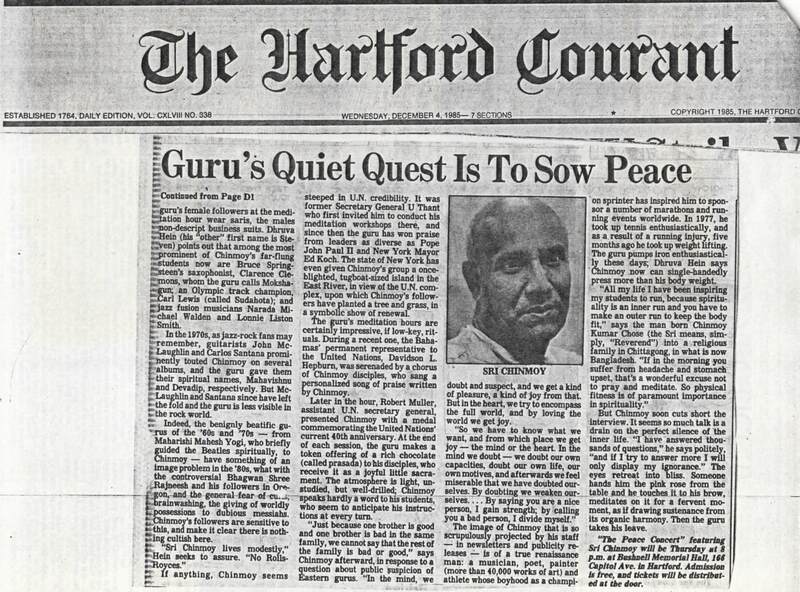 A selection of archive newspaper articles about Sri Chinmoy. 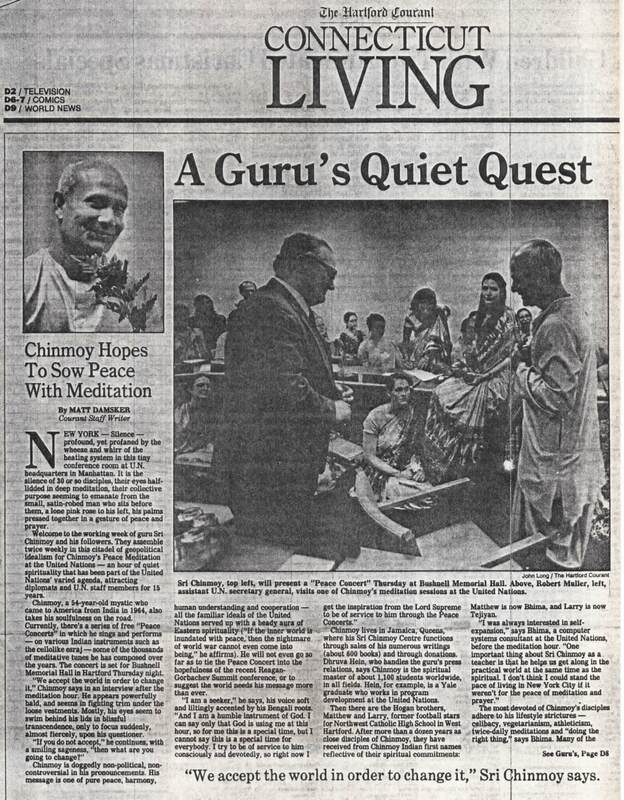 "Sri Chinmoy began his meditation series at the Interdenominational Church Center a few weeks ago at the invitation of a group of United Nations delegates, but he has been involved with the U.N. in other ways. Last spring he conducted a lecture series in the Dag Hammarskjold Library Auditorium at the invitation of Secretary General U Thant. He was invited again this fall for a similar series..."
By George Dugan; February 1, 1976. All of the sessions began with about 20 minutes of unbroken silence as Sri Chinmoy faced his audience and sought to move from one level of consciousness to another. His only words were to ask groups of followers to join in short musical interludes that served as a devout addition to the silence." Leaders mark National Day of Prayer at the U.N.
By George Dugan; July 25, 1975, page 35. "Sri Chinmoy, a Hindu and director of the United Nations Meditation Group, presided at the hour-long ceremony. He opened the meeting with silent prayer, standing behind a plain white marble altar. Then in brief comments, the leaders representing Christian, Jewish, Hindu, Buddhist, Baha'i and Muslim groups — called upon Americans to renew their "dedication to the eternal" in prayer and asked God to lead all the nations in "paths of righteousness." President of the Council of Churches of the City of New York. View: 6 Faiths Present at Church Center - pdf. Associated Press, November 1, 1985. "The Peace Meditation group at the United Nations, founded in 1970, seeks to keep delegates and employees focused on the ideals of the organization: cooperation and peace. 'There may be hurricane on the top of the ocean, but it doesn't mean there is a hurricane in the depths,' a spokeswoman for the group said in an interview. 'It is only by tapping the vast wealth of inner peace that we will ever be able to smooth the troubled waters of the United Nations. It's not necessarily a fast process,' she said..."
By Matt Damsker; Hartford Courant, December 4, 1985. "New York — Silence — profound, yet profaned by the wheeze and whirr of the heating system in this tiny conference room at U.N. headquarters in Manhattan. It is the silence of 30 or so disciples, their eyes half-lidded in deep meditation, their collective purpose seeming to emanate from the small, satin-robed man who sits before them, a lone pink rose to his left, his palms pressed together in a gesture of peace and prayer. Welcome to the working week of guru Sri Chinmoy and his followers. 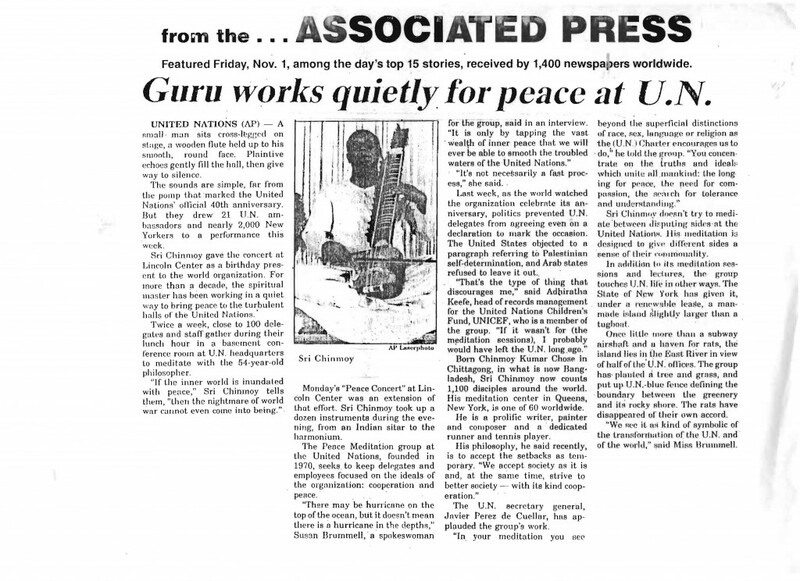 They assemble twice weekly in this citadel of geopolitical idealism for Chinmoy's Peace Meditation at the United Nations—an hour of quiet spirituality that has been part of the United Nations' varied agenda, attracting diplomats and U.N. staff members for 15 years."